I got the invitations for the big FAP party! This is a big deal because you must understand that there are NO pictures of my father and mother together at their wedding! And here I am, trying to create a 40th anniversary party invitation, and well, duh! 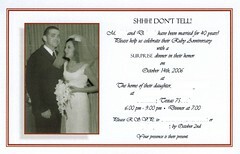 All anniversary party invitations MUST have a picture of the bride and groom on their wedding day! So from one picture where my father is standing on the left next to his father, who is standing next to my mother's mother, who is standing next to my mother, I created a picture where my father and mother are adorably posed for their wedding day! It turned out looking like some cute candid shot where they are both giddy with the excitement of the day and the prospect of a long and happy marriage to the beatiful person next to them. My father even appears to be gazing proudly toward the world about his treasured bride. Now this weekend, I get the joys of stuffing the envelopes, which, while quite tedious in itself, will be made more time consuming by my fabulous idea to add matte red confetti to the envelopes...Since the envelopes aren't lined ('cause that was way expensive!!) and I wanted to add some pizazz to opening the envelope, I decided red confetti pouring out would be really cool! Oh, also note, the paper the invitations are printed on is shimmery (which is why the picture looks sort of dotted)! It looks really cool. Oh, and also, I apologize for all the blanked out spots, but I think you all understand why I had to do that! Sooo...Without further ado...drumroll please!...The invitation! !